Can Bengaluru FC go one better in their second ISL Season? Bengaluru FC have started the ISL 2018-19 season, in pretty much the same way they went about their campaign last season but can they improve upon their performances? Having clearly topped the ISL points table, Bengaluru have garnered 13 points from five matches, with a draw against Jamshedpur FC being the only sour note of the season so far. New head coach Carles Cuadrat who started managing the side in AFC Cup Inter-Zone Semis in August, has taken a tough challenge head on, and he’s got his side playing a brand of attacking football, mixed with effectiveness and simplicity. Cuadrat has also been helped by the fact that the ISL Schedule has been kinder to his team so far, than it has been to some others. Cuadrat had his fair share of time with the squad at the AFC Cup, where Bengaluru were soundly beaten on aggregate by Turkmen side, Altyn Asyr. However, the Spaniard has had the opportunity to work with the squad and Bengaluru have gotten better with each passing game. The Bangalore-based franchise retained 12 players this season and five talented young players were added from the Bengaluru B team. 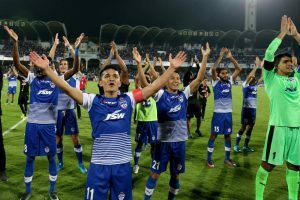 Captain Sunil Chhetri who has been in tremendous form in the recent games will have a massive role to play if Bengaluru are to win the title this season. Spanish midfielder Dimas Delgado who has returned after a consistent spell of injuries since last season’s ISL final has played a crucial role thus far, in manning the midfield alongside Erik Paartalu. He has been the key Bengaluru, linking the midfield to the midfield, and with constant support from Erik Paartalu and new signing Harmanjot Khabra, the midfield looks strong and dominating. The biggest plus for Cuadrat has come in the form of Spaniard Albert Serran, who has seamlessly replaced John Johnson at the heart of the Bengaluru defence. Cuadrat has also been hugely supportive of young Nishu Kumar who has come into the side and fit in magnificently to plug the hole left by the departure of Subhasish Bose to Mumbai City. Their hitman Miku already has 3 goals, with skipper Chhetri having scored four. Udanta Singh’s form will be a concern, but Cuadrat has said he isn’t worried about the Manipuri’s form, saying the winger has been doing everything asked of him on the pitch. Bengaluru have a formidable squad, as they have already shown, but their bench strength might be tested now, with the side playing six matches in 21 days after the international break. Chencho Gyeltshen has barely got a look-in thus far. Kean Lewis has impressed whenever he’s gotten game-time. Boithang and Semboi Haokip are able deputies too.